With a little inspiration, we can all find a hero’s heart beating within. Welcome back to my launch week celebration. If you missed my other posts, you can find the links at the bottom of this page. Today, I’d like to share my thoughts about being a hero. In Corgi Capers 3, several characters examine what it takes to be a hero. On the lighter side, little Sapphie escapes to the woods, facing cold and danger to help a friend in need. Likewise, Adam and Zeph venture into uncomfortable territory to follow what is right. Zeph is enlisted to act in a middle school play with Courtney. His character is his complete opposite: a brave, outgoing pup who pushes boundaries every day. Through the story, Zeph keeps the inspiring character in mind, challenging himself to move out of his comfort zone to brighten the world. Adam, like his dog, has been sheltered his whole life. But hanging out with his best friend Patrick and his new friend Gavin show him different perspectives, and for the first time, Adam considers what he might want to do “when he grows up.” As a volunteer at the local fire company, Adam realizes that ordinary people make sacrifices every day to make the world a better place. And on a more serious note, Courtney starts to see the world from a broader perspective, growing out of the harmful hijinks she participated in during Halloween. The common theme is that in some ways, each character has the heart of a hero. Like Adam, I grew up sheltered in many ways. It’s easy, given a comfortable life, to look beyond the struggles of fellow man. I’ve noticed, too, especially with social media and the prevalence of phones, how easy it is to become absorbed in one’s own world. In some ways, I fear we’re all losing the benefits of making good, old-fashioned human connections. Each of the main characters in Corgi Capers 3 grows in one way or another through his or her interactions with others. They all find themselves in new situations—often uncomfortable ones—but through the human connection they forge in these new circumstances, they learn and grow and become inspired. Misery is contagious, but so is happiness. My characters have learned the benefits of spreading happiness, and it’s something I hope my readers will be inspired to do as well. I’ve intentionally chosen Veterans’ Day to post about this element of Corgi Capers, and I’d like to thank all Veterans for their service to this country. It doesn’t need to be said that those serving in our armed forces do so with the heart of a hero and push themselves through situations that are more than uncomfortable. I have many veterans in my family, and I’ve seen only a fraction of the sacrifices they’ve made on our behalf. They are an inspiration to me. Today only, the first ten veterans of a US armed service to email me will receive an e-copy of Corgi Capers 1, 2, or 3, or The Scarred Letter or Faulkner’s Apprentice. Thank you to all veterans today and every day. You have the heart of a hero. Sign up to follow this blog via email (sign-up is toward the upper-right), and at the end of the week, I’ll randomly select a winner to receive a free copy of Corgi Capers: Curtain Calls and Fire Halls. Haven’t read the first two? The winner can choose one of the other Corgi Capers books instead. Winner will be chosen on or shortly after November 17, 2014. The prize will be the winner’s choice of Corgi Capers 1, 2, or 3. Paperback copy available only to U.S. addresses. International winners will receive choice of ebook version instead. Void where prohibited. I’ve already blogged about the winners of the Name that Cat contest and about the inspiration of one of the winning names. Being inspired to enjoy life is a constant theme in Corgi Capers, as Zeph (inspired by my own fraidy-dog Yoda) is afraid of most things. Many characters learn to find the heart of a hero beating within. Curious to learn more? You can view the trailer here. I’m pleased to be working with Yuming Cao to bring this bravery to life through illustration, and this illustrated corgi book will also be available soon. 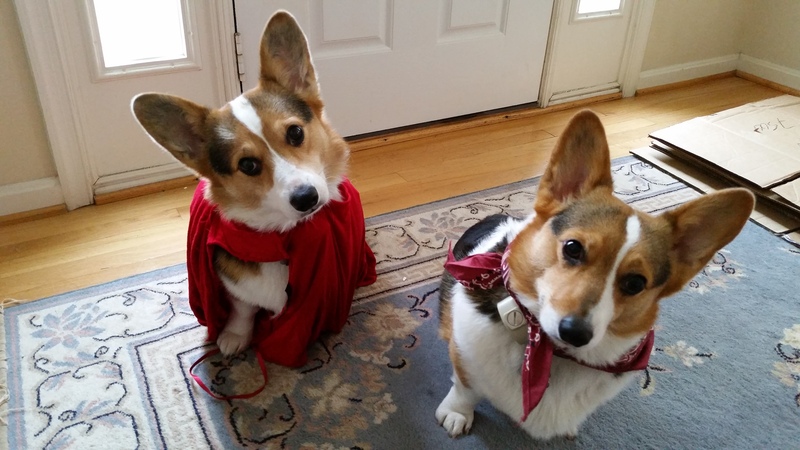 Posted on November 11, 2014, in character, corgi, corgi capers, giveaway, holiday, inspiration. Bookmark the permalink. Leave a comment.